PC Review: Yooka-Laylee | "DESTROY ALL FANBOYS!" it all feels so nineteen-ninety nine. But others have me screaming half the time. But still, it takes some patience to align. But tumbling off those ledges? Not sublime. and older fans will find a lot of shine. But now, it’s seen more classical than prime. So, is this vintage style worth your dime? Collectibles galore? Tough to decline! bringing those bugs to heel as benign. But there’s no need to yell a lot or whine. But only if the update redesigns! 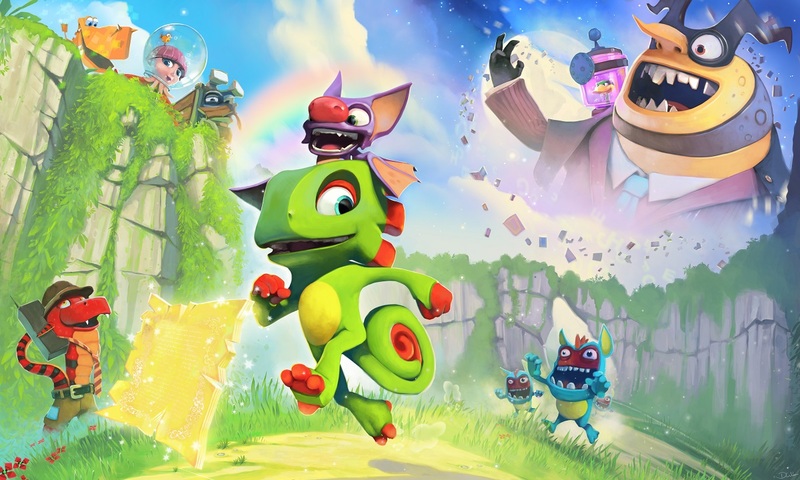 If you were or are a fan of the big open map collectible-filled mascot platformers that sprung up in the post-Super Mario 64 era (in particular, much of developer Rare’s assorted N64 output) Playtonic’s Yooka-Laylee will get you grinning right from the start with its many similarities and tweaks to the tried and true 3D platforming formula. It feels very much like a Banjo-Kazooie game with different characters and a more open world you can unlock at your leisure via collecting Pagies scattered around the five themed worlds. That said, while the art is certainly gorgeous and there’s plenty to do, a somewhat jittery camera doesn’t help the fun stay fun for extended stretches. The game is a patch or two away from being much better and it’s a given that the dev team wants everyone who picks up this enjoys the ride. Of course, it should have been a better game at launch that added some modern elements such as a less caffeinated camera and tighter controls (as any fan of some of Insomniac, Naughty Dog, Krome and other studios’ output these past few console cycles would most likely argue and agree on). While the colorful visuals and music are both stellar, the aforementioned jittery camera as well as some control issues knock the game down hard in a few spots. Currently, making precise jumps is hit and miss, some of the rolling areas are the first-person aiming mode is sluggish (a lock-on feature with aim toggle would have been better), and enemy hit boxes seem to rely on a random number generator or dark magic to work properly. You’ll do a spin or other move that would hit multiple enemies in other games, but here you’ll either whiff completely or knock some or all of them over. Interestingly, the big maps use an auto-save system that tracks collectibles but sets you back to the last doorway you entered if you expire, or in case of bosses, back to the start of said boss battle. Some things can be fixed by adding fencing to certain corners, platforms and ledges where you’ll currently go zooming off when simply trying to get from one point to another. Other things like the too short time you have to shoot in first person in some sections where you need to grab ammo then run and jump like mad to get to a spot to aim from simply need either more time added or an ammo counter implemented. One puzzle where the duo had to snag water ammo and make it to a floating platform to spray a talking, overheated vent was partly hampered by my reflexes not being as fast as they used to, but also the darn first person aiming not being fast enough when selected. Oddly enough, most of the mine cart sections I played took no more than three or four tries to pass. On the flip side, those bonus arcade games need some serious fixing as they tend to be more frustrating than fun. No issues were had here with the pun-filled eye-rolling humor (the 90’s era garbly-speak is take it or leave it), although you might be chuckling a wee bit too much if you’re playing with kids in the co-op mode and Trowzer is on screen. He’s a pants-wearing snake (*ahem! *) the main characters buy special moves from and there are a bunch more mild to deadly corny jokes here that made my old self grin every so often despite knowing almost no one under 40 would appreciate some of this stuff. Eh, to each his or her own, I guess. This is one of those games where you’re buying the whole fish and either picking your favorite cuts or eating it as it with intent to savor every bite including the not so tasty bits. We’re also in that unfortunate uncomfortable digital age where yes, games that drop need minor to major patching up post-launch and that’s a lot more common than some think. Yes, some of these games will be everything from big to small, eagerly anticipated ones people throw money at via crowdfunding as soon as they’re announced to unexpected indie hits that take on a life of their own over extended dev cycles where fans who know nothing about how hard it is to make games throw shade on efforts without realizing this isn’t a “perfect” process. Some games hide their flaws well, many don’t. I’m fully expecting some loyal super-fan to bust out a patch for PC users that may address some issues, but it’s up to Playtonic to do the heavy fixes here when all is said and done. I’d seen some grumbly pre-launch message board posts from folks comparing this to Mighty No. 9, a game that disappointed those expecting the second coming of Mega Man. 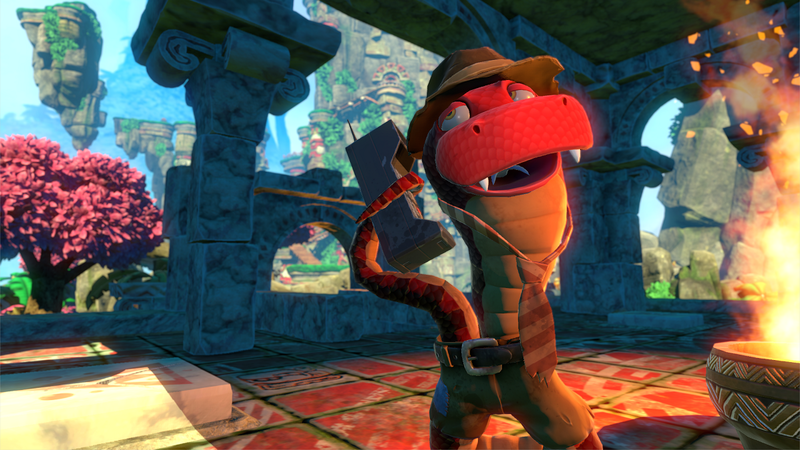 But Yooka-Laylee reminds me more of the first PC release of Slain last spring. In that case, the game launched with a bunch of issues that were pointed out to the developer by gamers and pro critics alike. The game was then greatly improved over the next few months for the better and re-released as Slain: Back From Hell for PC and later PS4, PS Vita and Xbox One. That redemption saved a gave that came out of nowhere and helped it become a superior product. So it’s going to be really interesting to see how Playtonic approaches the less positive reviews that hit the game on its issues. Granted, this very likely isn’t what all those crowdfunding backers want to hear and yes, some probably will approach this game with four sets of blinders on stubbornly refusing to see any major problems. 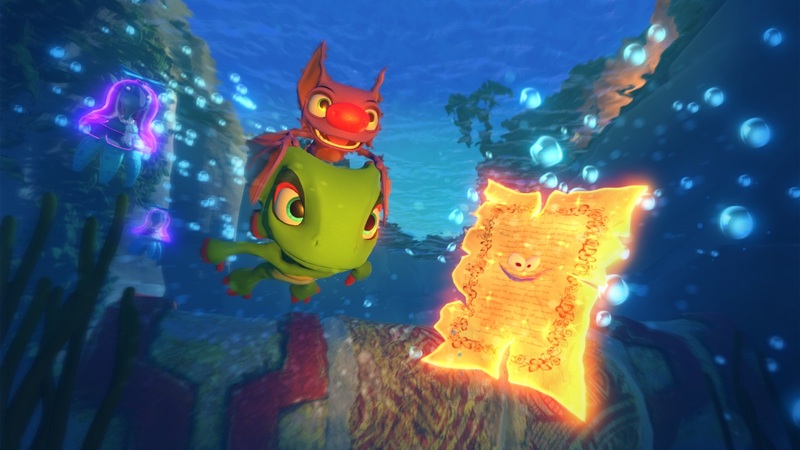 The hope here is that Playtonic steps a foot into this decade and at the very least makes that darn camera a lot less prone to moving so much. Not every new or older gamer wants to relive the days where you “got used to” something later games from other teams nailed down to make the overall experience a better fit for anyone who picks up a controller. Scoring a game in this state is a tricky bit of business, but I’d tell anyone who bought or plans to buy this that feedback to the developer, NOT the reviewer is what your aim should be. We writer types don’t usually make games, we just let you know what we think about them. This one’s got potential and if you own a PS4 or Xbox One and can rent it, I’m highly recommending that as an option. This entry was posted in 2017, Commentary, DAF, Features, Humor, Updates and tagged Bad Poetry, Commentary, Digital Games, Gallery, Indie Games, Microsoft, Nintendo, Nintendo of America, Nintendo Switch, Opinion, PC, PC Games, PlayStation 4, Playstation Network, Playtonic Games, PS4, PS4 Pro, PSN, Reviews, SCEA, Screenshots, Sony, STEAM, Team 17, Valve, VGA 101, Videogame Reviews, Videogame Trailers, Xbox Live, Xbox One, Yooka-Laylee, YouTube by geelw. Bookmark the permalink.